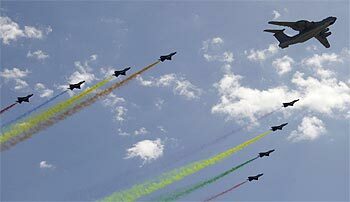 China celebrated 60 years of Communist rule on Thursday by staging its biggest-ever military parade of latest defence hardware and lavish pageantry with its top leader saying "only socialism can save" the country. 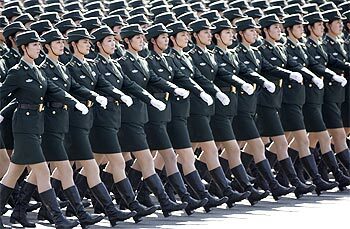 Amid tight security, thousands of troops marched in tight formations. 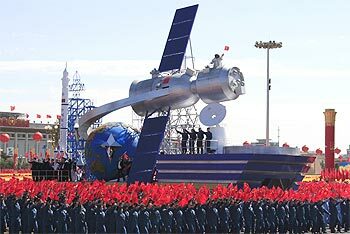 The People's Liberation Army, the world's largest military, also unveiled its most sophisticated weaponry including new intercontinental ballistic missiles in a patriotic show of force. 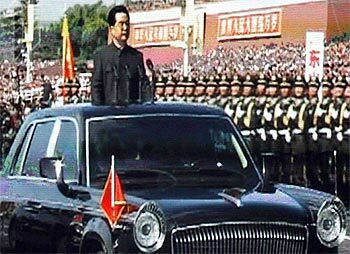 Chinese President Hu Jintao, dressed in a gray Mao tunic instead of the Western suit he usually wears, reviewed the troops and hundreds of tanks and other weaponry, shouting "Hello, comrades" while riding in an open-top, Red Flag limousine 'Made in China'. "We have triumphed over all sorts of difficulties and setbacks and risks to gain the great achievements evident to the world," Hu, also general secretary of the Communist Party said while addressing the nation from atop the Tiananmen gate ahead of the two-hour-plus festivities. "The development and progress of the new China over the past 60 years fully proved that only socialism can save China, and only reform and opening up can ensure the development of China, socialism and Marxism," Hu said, amid cheers from the patriotic crowd. "Today, a socialist China geared toward modernisation, the world and the future towers majestically in the East," he said. 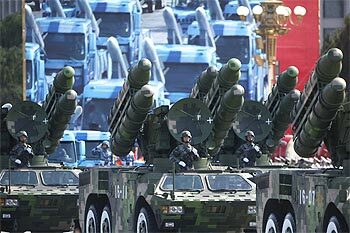 Over 10,000 forces manned the streets in stepped up security measures put in place for the massive parade along the Chang'an Avenue, during which the PLA unveiled its latest indigenous missiles, satellites and other weapon systems. The parade rivalled last year's impressive opening ceremony of the Olympic Games. 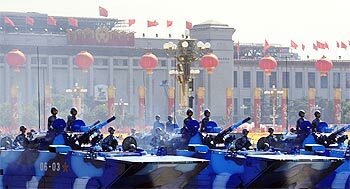 The capital saw an array of celebrations, including a parade at the historic Tiananmen Square, marking the 60th anniversary of the founding of the People's Republic of China. Over 10,000 security personnel were deployed in the capital while another 800,000 volunteers helped to maintain safety. People living close to the Square were virtually locked inside their homes as the roads were closed. Venues like the Forbidden City, the Tiananmen Rostrum and the Great Hall of the People were closed for tourists and will be open on Friday. Heavy security checks were in place for people entering the square, the world's largest, which was the centre of Thursday's celebrations. 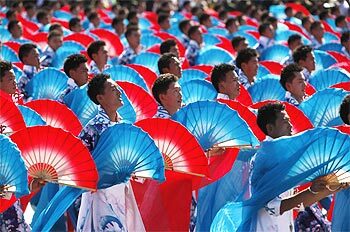 The mass pageant included performances by close to 200,000 people. The highlights of the evening party will include fireworks display which will last for 33 minutes. China was proclaimed a People's Republic on October 1, 1949, by Communist Party of China's chairman Mao Zedong after a lengthy battle against Chiang Kai-shek's Kuomintang or the Chinese Nationalist Party in the Chinese Civil War that stretched for two decades. The Beijing Olympics hosted by the Chinese last year were widely believed to be a showcase of China's economic strength. 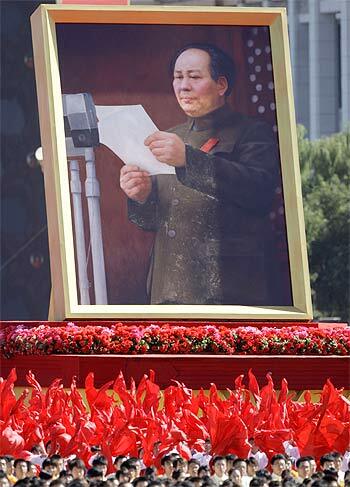 A large number of floats, tableaux and performers took part in the celebration that marked the birth of Mao's China. 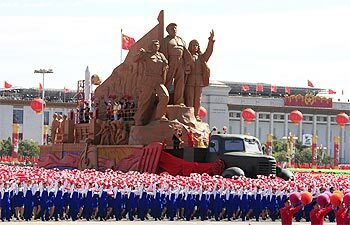 The Communist party has spared no expense to choregraph one the most spectacular celebrations in the world.